Overdue post! We're back from Bali - the long Tết holiday is over. 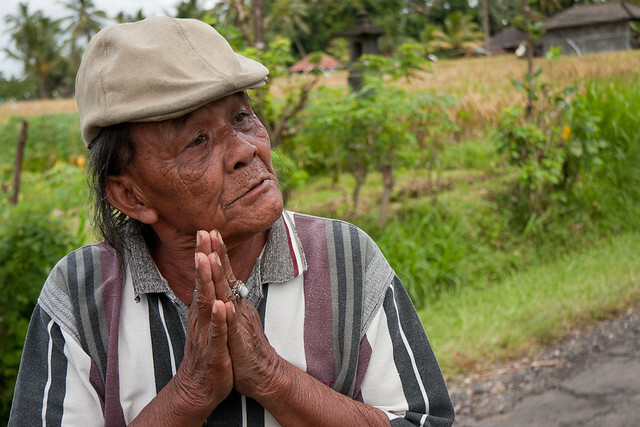 On a bike tour, in the rice fields, this happy fellow elaborately welcomed us to Bali, making a point of mentioning that we were welcome irrespective of our faith. When I asked to take a picture, he insisted that my wife be in it too. When seeing the result, he exclaimed "I am handsome" and welcomed us once more. That's when I snapped this. Bali was not quite what we expected. Gorgeous luxury hotels, check. Beautiful, quiet and spiritual, kind of. Beautiful whenever you get away from the road - it seems pretty much all significant roads are lined with shops. The 40km (25mi) drive from Jimbaran to Ubud was at least 80% lined with shop after shop. Half of the rest was other buildings. Leaving little view of the landscape. How did the chicken cross the road?